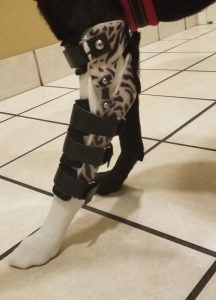 Why choose a custom orthotic over a Ready-To-Fit brace? Custom Orthotics may take 1-4 office visits before the final product. First, we will need to do an initial consult ($150) to ensure your pet’s diagnosis is confirmed and correct. 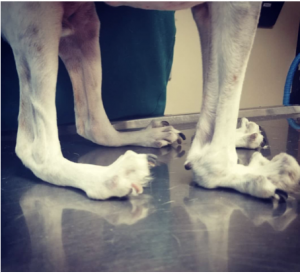 From there, we can either make a molding of your pets limb which is done under a very mild sedation same day as the consult, if time permits or schedule the molding for another day. You are also able to choose the orthotic color and design at no additional cost! The molding is then sent off to our Orthotist who will make the final product. This process takes 2-4 weeks depending on their case load. The orthotic will be sent directly to us for inspection. We will then reach out to you when the orthotic is ready and schedule the fitting. We do not charge a fitting fee for custom orthotics. If the custom orthotic does not fit, we will send it back to the Orthotist to be modified. There is no charge for modifications. 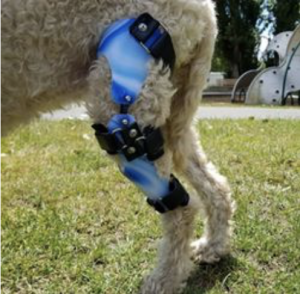 Typically, the orthotic will last the lifetime of your pet. 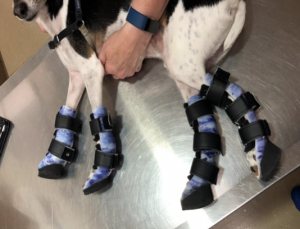 If your pet is particularly rough with the orthotic, you may be able to have it “refurbished” (We will contact the Orthotist for current prices) or we may have to start the process over. 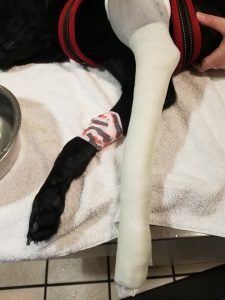 To date, we have not had to mold and cast an additional orthotic for a pet.